It’s the third startup I’ve been involved in, but this one is very different. This one will actually fly. After a month and a half, we know it can. The biggest difference is that for the first time, we have actual employees and the company is our only source of income. This not only motivates you, but also allows you to focus much better. I’m happy because finally I have the opportunity to test out all those ideas about how a company should function, to have the freedom to decide what I make and what I sell. To have total ownership of what I create and to be able to share it with whoever I please. I’m happy to have the freedom to blame no-one but myself if things don’t go as they should. And I’m happy to work in a place where everyone else has that same freedom. To do great work, to take risks, to make a difference and to have fun. Speaking of creating, I actually do a fair bit of R&D (after all, that’s what it says on my business card) at mcare (we’ve even developed some hardware, more on that later). I’ve decided to open source everything that might be useful to other people in this field. The first project is MTK - a collection of scripts for OS X and hardware testing. Our service engineers sometimes ask me to write tests and they all end up in MTK. 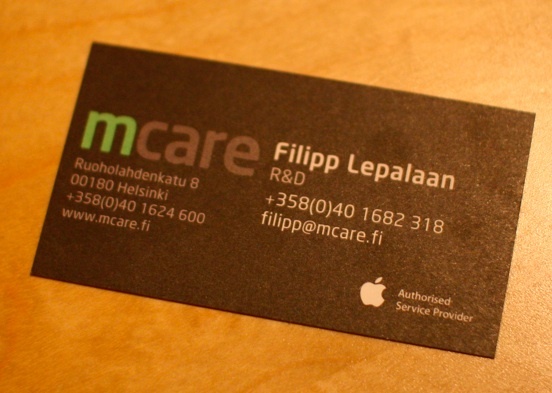 Anyways, if you’re in the Helsinki area and looking for fast, friendly and professional service for your Mac, iPod or Apple accessory, please drop by!